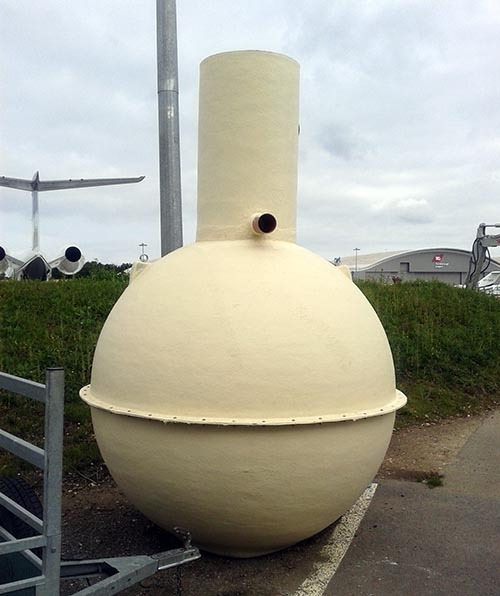 Hartley Services can supply and install traditional onion shape septic tanks or the low profile cylindrical tanks that are designed for high water table or hard rock conditions. We make sure that we choose the correct tank for the particular site conditions and size of property with all new tanks tested and certified to EN12566-1. A percolation test will need to be carried out to determine the permeability of the sub soil before any Sewage Plant or Septic Tank can be installed. 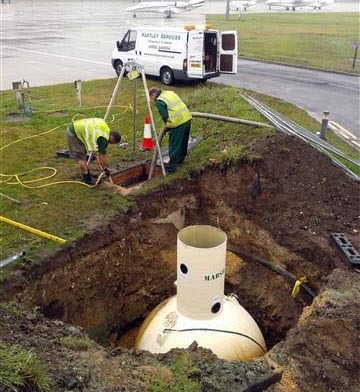 The rate of permeability calculated from the percolation test allows the correct size of soakaway to be designed. Our experience of many years will allow us to undertake these percolation tests and provide you with the correct solution for your site. We undertake percolation tests for domestic and commercial applications. Contact us today on 01252 842554 for a free, no obligation quotation and professional advice on the most suitable solution for your property. Sadly, many Sewage Systems and Septic Tanks suffer from neglect with failure to de-sludge the Septic Tank at regular intervals being the main cause. If the solids and slurry are allowed to build up within the tank, higher levels of suspended solids within the effluent enter the drainage field, which in turn could cause premature failure with costly consequences. Our engineers are experienced in carrying out internal repairs to Septic Tanks and replacing broken ‘T’ pipe (dip pipes) and internal separation partitioning walls. The No.1 problem with Septic Tanks is, more often than not, soakaway failure normally due to the lack of maintenance or regular cleaning of tanks. If the outflow is restricted then the system will soon backup. It is therefore important that this problem is identified early to save both time and money on remedial repairs that are unlikely to work. Once a problem with the soakaway has been identified it will then be necessary to determine which type of land drainage will best suit the area. 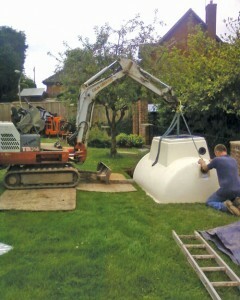 This could be by way of a normal soakaway, land drains, pumped systems or boreholes are just a few options available. A Packaged Sewage Treatment Plant (PSTP), is a more environmentally friendly solution to septic tanks. This cleaner process uses mechanical components to help break down solids to form an effluent that’s cleaner and approved by the Environment Agency for discharge into watercourses as well as standard drainage fields. Hartley Services will design, supply, install and maintain the PSTP for single domestic households to commercial buildings, schools, public houses and hotels. We will assess the individual requirements of your project and then suggest the sewage treatment plant options that suit your needs. PSTP's should be sized using the latest version of British Water Flows & Loads (see downloads below) which provides detailed information on sewage production figures and sizing calculations. 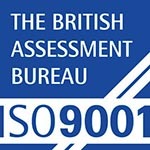 Regulatory authorities for the control of pollution in the UK normally require treatment plants conforming to BSEN12566:3 to be demonstrated as capable of producing a minimum effluent discharge quality of 20:30:20 (Biochemical Oxygen Demand; Suspended Solids; Ammoniacal Nitrogen in mg/ltr), although in certain areas more stringent site-specific qualities may be required. No surface water should enter the system as this can reduce the system's capacity and cause solids to be flushed out which may prematurely block the drainage field or cause pollution. How does a treatment plant work? Package Sewage Treatment Plant's are often a suitable option where groundwater in the surrounding environment is vulnerable, drainage field percolation values are restrictive, or direct discharge to watercourse or surface water sewer is the preferred discharge method. 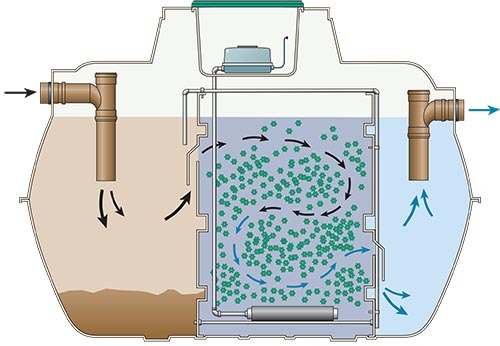 In addition to the anaerobic digestion taking place in the primary settlement tank (as with septic tanks), the sewage plant unit allows the clarified water to pass into a second 'aeration' chamber where it is treated to remove the dissolved constituents. Here aerobic bacteria, supported by diffused air and mobile media, ensure full treatment is achieved before the treated effluent flow to a final settlement chamber prior to discharge. All treatment plants supplied by us are tested to BSEN12566:3 and CE-marked to ensure compliance with latest environmental and Building Regulations requirements plus they carry a manufacturers 25 year structural guarantee. It is recommended that you should service your treatment plant every 6-12 months to ensure all mechanical and electrical components are fully operational. Over time there will also be a build-up of sludge that naturally accumulates during the process. As a professional waste management team, we can clean and service your treatment plant to ensure it continues to operate effectively and doesn’t cause any pollution with the discharge. The team here at Hartley Services are reliable and friendly professionals with a wealth of experience in delivering waste management services.